We are in a day and age where we are constantly worried about what we consume. One thing the entire world consumes is water. Unfortunately, not everyone is lucky to have free, easy access to safe and healthy water.Thankfully, getting clean and fresh drinking water is easier now with the help of a reverse osmosis system. In this article, we will teach you how to install reverse osmosis system. For people who don’t even know what reverse osmosis is, it is a new technology which is used to take out almost all the contaminants in the water. It removes it by eliminating the water under very tough pressure through a semi-permeable membrane. Drinking water from a reverse osmosis home system is cheaper than buying bottled water in the long run. Moreover, it is also environmentally friendly, as buying bottles of water means more use of plastic. So, if you need one for your home, this article will guide you step by step on how to install reverse osmosis system. A reverse osmosis filtering system. Make sure you buy one that comes from a well-reputed brand. You wouldn’t want to cut cost on this. These are all the essentials that you need to install a reverse osmosis system. So, let us begin with the procedure now. Mounting the water supply feed: Oftentimes, the filter assembly will hang either from the side or the back wall under the sink. Take the saddle or the T valve and carefully install it, by switching off the hot and cold water functions. The said saddle or the T valve will come along with the reverse osmosis filter. Once you have accomplished this, you will need to take the tubes and push it into the inlet valve. It is important that you tighten it, first with your hand and then you can push it with your tool. However, it should not be too tight. Attaching the sink mixer: Once you have accomplished the previous step, you will need to feed all the water supply lines into their respective new destinations. This will include the main supply of the water as well as the two waste lines. You have to ensure that it goes through the gasket and the base of the faucet. It takes a while, but it is important to ensure that everything is reaching its intended place. The two waste lines will have no connection to any of the supply. However, these should run through the base of the faucet to completely stop backups. You can cut off the excess tubing if there is any. Attaching the drain line connector: This part is crucial. You have to attach the drain line connector carefully and connect it to the base which is at the bottom of the sink. Mounting storage tank: This is the last part of the process. Now you will have to carefully mouth the reverse osmosis filter. This will fit in on the wall below the sink. Additionally, in this time you will also need to install the main and final waterline in. Check connections carefully: With everything set up and done, you need to make sure that the connections were installed properly. Check every connection whether it is loose or not and tighten it if needed. Take a damp cloth and clean the entire water filter system. Use water and a disinfectant to clean the parts of the water filter system that you just installed. Once done, turn on the water supply to test the system. If there is any problem, then check you water filter system again and make sure that you followed every step that is mentioned in this article. If everything is fine, then let the water supply from the filter turned on for a bit. Reverse osmosis water filters need to be maintained like any other systems to prolong its life and to avoid any additional replacement costs. 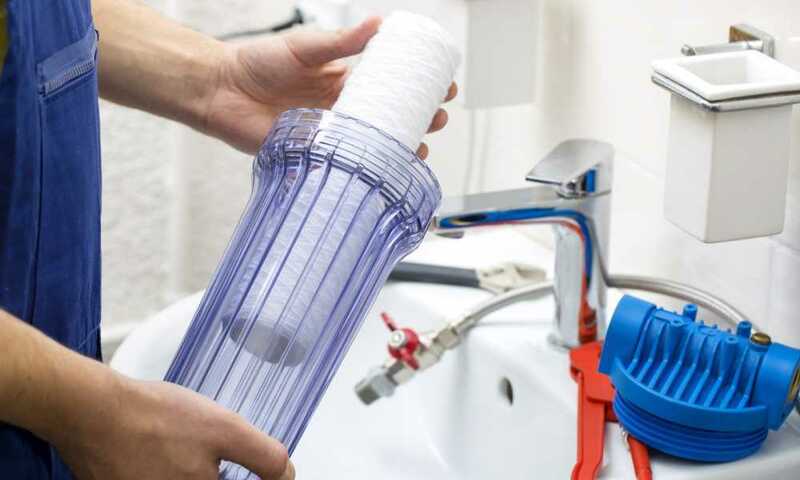 Even though it is easy to install reverse osmosis water filter, there are some who still prefer calling a professional or a plumber to fix it for them. So, if you are worried that you will not fix the filter the correct way or do not have the necessary tools and just don’t have the time, then we recommend that you hire someone to fix the filter for you. There are also multiple sizes of reverse osmosis water filters available on the market. We recommend is to purchase the 50 GPD (gallon per day) rated reverse osmosis water filter. In terms of cost, there isn’t much difference between a lower GPD filter and a higher GPD filter. There are tons of benefits of having a reverse osmosis water filter at home. It can provide as low as 10 gallons of water a day, or as much as 75 GPD. A good reverse osmosis filter does not have to be pricey; you just have to be meticulous in choosing the right brand to make sure you’ll achieve your goal of having safe and healthy drinking water for your family. Whether you prefer a reverse osmosis water filter or not, you have to admit that this is quite an ideal product to have 100% safe drinkable water anytime at your home. Not only will you have gallons of safe and chemical free drinkable water daily, but you will also do the environment a huge favor by not opting for harmful plastic water bottles. We hope this article on how to install reverse osmosis system has given you enough information and we hope it becomes a perfect guide for you to install your own water filter at home.